During the 1920s and 1930s Glebe streets, as those in other inner city suburbs, were the haunt of criminals fighting for control of illegal activities such as off-course betting and the sly grog trade. Vying for supremacy were Mobs named for their local areas: The Rocks, The Loo, The Railway, Surry Hills, Redfern and Newtown. The Glebe Mob hung out at the Australian Youth Hotel run by Mick McGrath who conducted his SP bookmaking operations there and lived around the corner. Other preferred watering holes were the Ancient Briton and the Toxteth. Juvenile mobsters were mostly engaged in shoplifting, thieving and fighting. Some became career criminals. Glebe ‘heavies’ included Harry ‘Boo’ Stanton, ‘Tinker’ Wilson, ‘Googer’ Morgan, Charles ‘Kicker’ Kelly, ‘housebreaker’ Roy Shirley (alias Arthur Roy Shirley alias Augustine Arthur Roy Shirley alias John Williams), ‘Chow’ Hayes and ‘Paddy’ Roache. The last, Patrick Francis Roache (1903-80) was a typical opportunistic small-time crook. 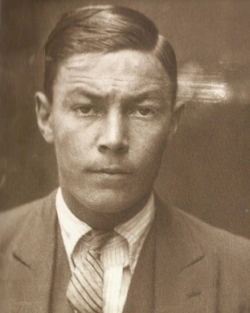 His first conviction was in January 1920 when as a 17-year-old labourer he was given seven days’ hard labour and put on a twelve-month good behaviour bond for stealing. In February he was charged with shooting with intent after Thomas Mason chased a group of youths away from his Ultimo home and Roache returned with a revolver. Mason was unhurt however; and Roache, who maintained the bullets were blanks, was acquitted. Soon after, Patrick was back in court with his older brother Richard (1900-70) and Henry Robert Gray charged with stealing £1000 worth of cloth from the David Jones warehouse in Christie St Glebe. Henry and Richard were acquitted, as was Patrick after a retrial. Richard Roache appears to have stayed out of trouble after this incident. The Roache brothers were the illegitimate sons of Alice Roache who lived at 47 Grose St. On 31 October 1907 she married Walter Llewellyn Lloyd (1882-1958) at the Whitefield Institute connected with the Congregational Church in Pitt St. The Institute, which lasted from 1903 to 9 under the leadership of bankrupt preacher Edward Tremayne Dunstan, had an affiliated congregation in Glebe. The couple divorced in 1916 on the grounds of Walter’s desertion and the next year Alice Lloyd married Walter Arthur Church at Glebe. In November 1921 Paddy Roache again stole cloth from the David Jones warehouse plus goods from others in Glebe: the Rubber Company, kitchenware from Kathleen McCarthy’s shop at 55 Glebe Point Rd, and a typewriter and chairs from Ernest John Channon’s factory. Roache and his accomplices drove off with their loot in a pony-drawn cart. After serving three years’ hard labour in Bathurst Gaol he was one of those charged with bashing and robbing a tram conductor in City Rd. When the victim claimed he couldn’t identify his attackers, the five were acquitted. Richard Denis Meagher often appeared as defence counsel for Roache and his mates. In 1931 Roache was back in gaol after stealing a crate of chickens and assaulting a police sergeant; in 1933, in court on new charges of stealing, Roache was described as ‘the worst type of criminal’, demanding money from people in his Glebe neighbourhood and terrorising them if they didn’t give it. Although declared a repeat offender under the 1905 Habitual Criminal Act, his two-year sentence was quashed on appeal. In 1937 he was bagman for standover man Eric Pulley who was shot dead by SP bookmaker Florence Riley in her Wentworth St house. Roache committed nearly all his crimes in the company of others. Alone, his modus operandi was to lure drunken men into dark streets where he robbed them. Daytime, he stole the odd chicken in Paddy’s Markets, loafed in University (now Victoria) Park, and hung around street corners in Glebe. Among his regular associates were Thomas Esmond Bollard and Ezzie’s cousin John Frederick Hayes. A Catholic and born illegitimate, ‘Chow’ Hayes was raised by a grandmother and an aunt. He truanted and spent time in reformatories such as the Gosford Boys Home. By age eight, his school days over, he was making money selling newspapers near Railway Square. He was first convicted at age 15. An early sentence was seven months for shoplifting 18 shirts from Anthony Horderns and spitting on policeman ‘Mad Digger’ Toohey. 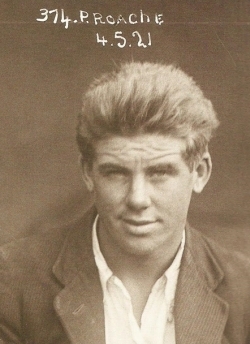 As a 19-year-old in 1930 Hayes had already been in court 14 times, and by the end of the decade he had a reputation as one of Sydney’s toughest criminals, a hard-drinking standover gunman who would simply walk into sly grog shops and similar places and demand money. His favourite haunts were Haymarket, Ultimo, Chippendale and Glebe. In January 1939, with a history of 70 convictions, Hayes was fined £5 for throwing coffee over the proprietor of a Glebe hamburger shop who refused to serve him. At Glebe Police Court, Detective Corcoran described the routine of Hayes and his associate Edward John Conroy (who had drawn a gun on the shop owner): ‘They hunt in packs at night and create a reign of terror in parts of Glebe’. Hayes often attacked without provocation. In February 1939 police sergeants Cunningham and Hale and constable Ireland were called to Talfourd St where shots had been fired and discovered a drunken Hayes with a bullet wound in his chest. He was taken to Glebe Police Station – which had to be closed after a curious crowd gathered outside – and then to RPA Hospital where he told Glebe’s detective constable Ray ‘The Blizzard’ Blisset that he’d been hit by Father Christmas. Prepared for surgery and wearing only a hospital gown, Hayes was momentarily left unattended. He climbed out of a window, rang his mate ‘Kicker’ Kelly from a public phone box, and was picked up and taken to ‘Dr George’ (his practice was near Glebe Public School) who removed the bullet while Kelly went off to pick up fresh clothes for the patient. Hayes’ crimes included consorting, theft, break and enter, resisting arrest, demanding money with menaces, riotous behaviour, indecent language, armed robbery occasioning bodily harm, assaulting police, evading taxi fares, and murder. In 1952 he was sentenced to death (commuted to life) for shooting dead ex-boxer William ‘Bobby’ Lee in the Ziegfield city nightclub in front of more than 70 patrons, none of whom would testify as witnesses. At this, the third trial, a list of 90 prior convictions was read out to a noisy courtroom. Hayes was out of gaol again by 1969 when he glassed a fellow drinker in a Camperdown wine bar who had picked up change left for the barmaid. This act brought a sentence of five years. His final release was in 1977. Survived by a daughter, Hayes died in 1991, predeceased by sons Jacky, Paddy and Bobby and Gladys Muriel ‘Topsy’ née King (1913-69) whom he had married in 1931. His portrait by Bill Leak was hung in the 1991 Archibald exhibition. Sources: Bathurst Times 11.2.1920; Doyle, Peter Crooks Like Us 2009; Evening News 14.4.1930; Hickie, David Chow Hayes: gunman 1990; Maitland Daily Mercury 4.1.1939; NSW births, deaths, marriages registry; NSW cemetery records; NSW electoral rolls; NSW Police Gazette various issues 1920-30; Sands Directories; Solling, Max Grandeur & Grit: a history of Glebe 2007; Sydney Morning Herald 20.7.1920; Truth 12.4.1925, 9.11.1930, 23.11.1930.